Physicians and patients should demand, and participants in the system should provide, transparency in all of the areas of drug approval and reimbursement (Table 1). The current situation, in which the evidence used to make decisions often remains secret and the decisions are not adequately explained to the public, is untenable. We wrote this commentary in response to the House of Commons Standing Committee on Health's 2007 parliamentary review of the Common Drug Review program. Established in 2002 by the federal government, the Common Drug Review was charged with evaluating the cost-effectiveness of new outpatient drugs and to make recommendations to Canada's publicly funded drug plans.1,2 Although many submissions to Parliament's Standing Committee on Health legitimately criticized the Common Drug Review's lack of transparency, we believe that the scope of both the criticism and the review itself was too narrow. We suggest that, from start to finish, the drug evaluation systems in Canada and elsewhere lack transparency. Transparency is important for several reasons. First, the availability of detailed information about a drug's benefits and harms would allow interested individuals to review and analyze trial data themselves. If independent analysts come to the same conclusions as regulators and other decision-making bodies, confidence in the decision-making process would increase. Second, a lack of transparency always gives the impression that something is being hidden. The drug evaluation system would be perceived as being more legitimate if the public were aware of how and why decisions are made and had an opportunity to provide input. Governments might also benefit from increased public trust. Finally, increased scrutiny of the decision-making process might lead to better decisions. Full transparency should begin when a drug is first tested in humans. Detailed protocols of all trials should be registered with an independent group providing public access to up-to-date information on clinical trials (e.g., www.clinicaltrials.gov). Results should be publicly available when a pharmaceutical company applies for the drug to be licensed. Registration before trials are started is necessary because positive studies are more likely to be published than negative studies.3 Furthermore, published trial reports often inaccurately describe the planned analysis and only report a subset of the outcome measures, leading to an unrealistically optimistic assessment of a drug's efficacy. For example, a study by Chan and colleagues4 that examined differences between trial protocols and final publications reported that the primary outcome described in the protocol was altered more than 50% of the time and that the outcome was omitted from the final publication altogether in 26% of cases. 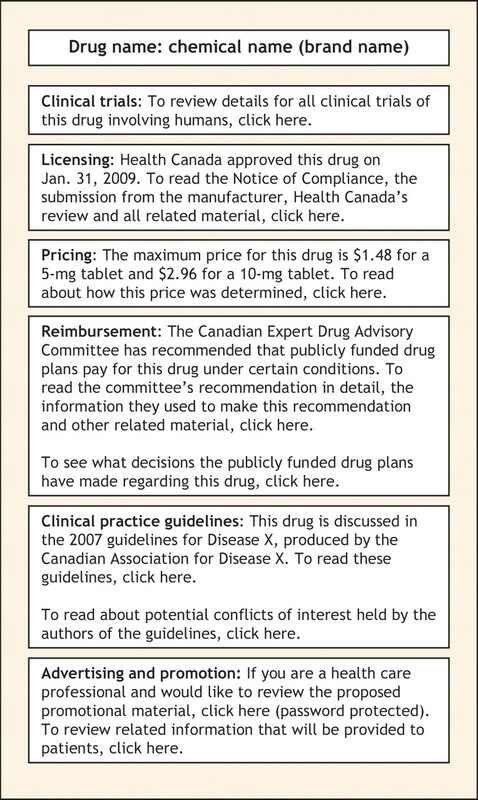 After a brand-name drug is licensed by Health Canada, its price is set by the Patented Medicine Prices Review Board. On the surface, this appears to be one of the most transparent steps in the drug evaluation system — the Patented Medicine Prices Review Board limits the price of a “breakthrough” drug to the median of the prices for the same drug in 7 similar countries. However, undisclosed deals between pharmaceutical companies and public payers in other countries14 may result in Canadians paying artificially inflated prices. With the Patented Medicine Prices Review Board currently reviewing its Excessive Prices Guidelines, the time is ripe for modifications that would provide true transparency in the pricing of patented drugs. For a licensed drug to be widely prescribed, a pharmaceutical company generally needs to have the drug listed on publicly funded drug plan formularies, such as BC PharmaCare and the Ontario Drug Benefit Program. Decisions to include drugs on formularies are guided by recommendations of the Common Drug Review process of the Canadian Agency for Drugs and Technologies in Health. Although the Common Drug Review publicly releases the recommendations and rationale of its expert advisory committee (www.cadth.ca), pharmaceutical companies have insisted that some of the data necessary to make these decisions be kept confidential. The Common Drug Review should make public each pharmaceutical company's submission, internally and externally commissioned reviews, and the minutes of its meetings. In rare instances it may be necessary for select data to remain confidential for a brief period (e.g., to meet restrictions imposed by medical journals), but data required to make reimbursement decisions should never remain secret for longer than a few months. Although journal editors have recently indicated that brief publication of results in trial registries will not jeopardize acceptance in a journal,17 they have not yet explicitly stated that prepublication of cost-effectiveness analyses by groups such as the Common Drug Review will be treated similarly. We are unaware of any jurisdiction that demands transparency in each of the areas we have described above. Therefore, Canada can be an international leader in this area. We propose that an independent agency be established to develop a single, searchable website with information relating to each of the domains described above. Information should be organized by drug, so that physicians and patients can efficiently find all relevant information about a drug of interest. Figure 1 presents a schematic of how this information could be presented. Figure 1: Schematic for a website that would increase transparency in the drug evaluation system. Increased transparency in some of the areas described above will require not only considerable political will, but also legislative changes (e.g., to prohibit drug companies from keeping their submissions to Health Canada confidential). However, the importance of developing drug policies that balance access, safety and cost demands not only that we achieve transparency, but also that we do so rapidly. Current efforts toward increasing transparency are slow and often confusing. Some will regard our recommendations as naive. They will argue that Canada is a small country and that pharmaceutical prices and policy will always be driven by international forces, particularly the American market, which represents half of worldwide drug sales. Our critics will suggest that adopting our proposals would weaken intellectual property rights and result in pharmaceutical companies choosing not to sell their drugs in Canada. This eventuality is unlikely if an international consensus on transparency is developed. Canada should take a leadership role in this area and begin rapidly taking steps to improve transparency in pharmaceutical policy. •	Transparency in pharmaceutical policy-making would probably lead to increased confidence in the decision-making process and to better decisions. •	In addition to the pharmaceutical industry, researchers, governments, quasi-governmental agencies, payers and medical journals need to make more information available to the public. •	Because no country has full transparency in pharmaceutical policy-making, Canada could be a world leader in this area. Contributors: Both authors drafted and revised the manuscript and approved the final version. Acknowledgements: We thank Muhammad Mamdani, Bruce Carleton, Joel Lexchin and Ken Bassett for their thoughtful comments on a previous draft of this article. Competing interests: From 2003 to 2006, Andreas Laupacis was Chair of the Canadian Expert Drug Advisory Committee, the independent advisory body that makes recommendations to publicly funded drug plans as part of the Common Drug Review process. He was compensated for this work. He currently sits on 2 data safety monitoring boards as well as a Novartis advisory board and is paid for this work. Laupacis A. On bias and transparency in the development of influential recommendations. CMAJ 2006;174:335-6. Tierney M, Manns B, et al. Optimizing the use of prescription drugs in Canada through the Common Drug Review. CMAJ 2007;178:432-5. Easterbrook PJ, Berlin JA, Gopalan R, et al. Publication bias in clinical research. Lancet 1991;337:867-72. Chan AW, Hrobjartsson A, Haahr MT, et al. Empirical evidence for selective reporting of outcomes in randomized trials: comparison of protocols to published articles. JAMA 2004;291:2457-65. Gotzsche PC, Hrobjartsson A, Johansen HK, et al. Ghost authorship in industry-initiated randomised trials. PLoS Med 2007;4:e19. Laine C, Mulrow CD. Exorcising ghosts and unwelcome guests. Ann Intern Med 2005;143:611-2. [email protected]: FDA approved drug products. US Food and Drug Administration, Department of Health and Human Services. Rockville (MD): The Administration; 2007. Available: www.accessdata.fda.gov/scripts/cder/drugsatfda/index.cfm (accessed 2007 Nov 22). Drummond M. Should commercial-in-confidence data be used by decision makers when making assessments of cost-effectiveness? Appl Health Econ Health Policy 2002;1:53-4. Topol EJ. Failing the public health — rofecoxib, Merck, and the FDA. N Engl J Med 2004;351:1707-9. Drugs and health products. Ottawa: Health Canada; 2007. Available: www.hc-sc.gc.ca/dhp-mps/prodpharma/index_e.html (accessed 2007 Nov 22). Yeates N, Lee DK, Maher M. Health Canada's Progressive Licensing Framework. CMAJ 2007;176:1845-7. Wright JM. Progressive drug licensing: An opportunity to achieve transparency and accountability? CMAJ 2007;176:1848-9. Hoadley JF. The continued need for independent research on prescription drugs. Health Aff (Millwood) 2004;23:244-9. Silversides A. Pharmacies receiving massive rebates from generic drug-makers. CMAJ 2006;175:342. Patented Medicine Prices Review Board. A study of the prices of the top selling multiple source medicines in Canada. Ottawa: the Board; 2002. Available: www.pmprb-cepmb.gc.ca/CMFiles/study-e22SHF-8292005-2710.pdf (accessed: 2008 Jan 9). Ontario Ministry of Health and Long-Term Care. Alendronate/Cholecalciferol: recommendations and reasons. Toronto: The Ministry; 2007. Available: www.health.gov.on.ca/english/providers/program/drugs/ced/pdf/alendronate.pdf (accessed 2007 Nov 22). Stelfox HT, Chua G, O'Rourke K, et al. Conflict of interest in the debate over calcium-channel antagonists. N Engl J Med 1998;338:101-6. Clinical practice guidelines and conflict of interest. CMAJ 2005;173:1299. Steinbrook R. Guidance for guidelines. N Engl J Med 2007;356:331-3. Kent A. Should patient groups accept money from drug companies? Yes. BMJ 2007;334:934. Mintzes B. Should patient groups accept money from drug companies? No. BMJ 2007;334:935. The direct-to-consumer advertising genie. Lancet 2007;369:1. Regulating prescription drugs for patient safety: Does Bill C-17 go far enough? Will Open Government make Canada's health agencies more transparent?